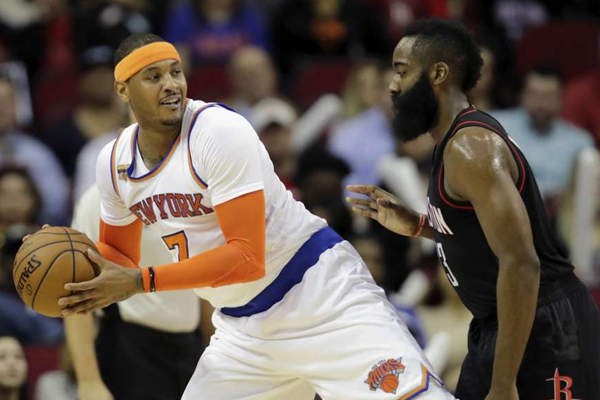 The New York Knicks and Houston Rockets have reached a silent impasse in Carmelo Anthony trade negotiations. Like Woj points out, the Rockets have been unable to find a third and fourth team to help facilitate a deal. And no agreement is being struck until they do. Though Anthony’s timeline no longer remotely jibes with the Knicks’ window, they have no business absorbing the three years and $61.3 million left on Ryan Anderson’s contract. Likewise, the Rockets shouldn’t cough up players of actual value to them, like Eric Gordon and Trevor Ariza, to bring in the 33-year-old who, assuming he opts in for 2018-19, will earn around $54.2 million over the next two seasons. Given how long this thing has dragged out, one of three things must happen for Anthony to get the relocation he clearly wants: The Rockets need to sweeten the pot for the Knicks and/or prospective third and fourth teams; the Knicks must warm up to the idea of taking back long-term money; or Anthony must open up his list of preferred destinations to squads outside Houston. History tells us it’s the Knicks, but considering how they’ve approached the situation thus far, it seems as if they’re prepared to enter training camp with Melo still on the roster.